I never liked the leather boot and it was always dirty and a pain to clean. I bought one of these and had it painted and it loogs great and is very easy to keep clean. It also provides a place to set stuff. Lost your wallet? Lost your phone? Lost your mind? It likely slipped between the seat and the center console of your MINI. If you're like most people, you have a few french fries in there, too. 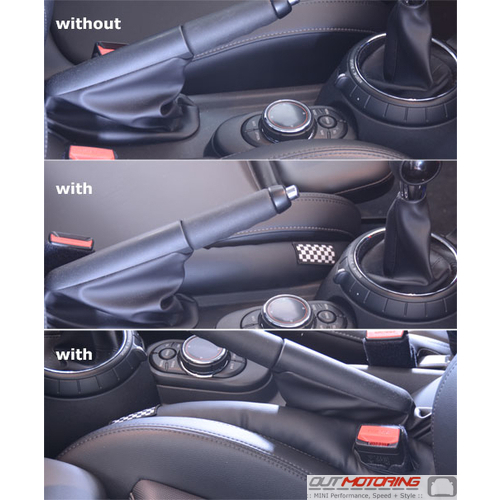 Keep that stuff from slipping into the void by blocking it with this flexible gap filler that stays in place by hugging the seat belt connector. Sold as a single piece. Features tastefully placed checkered flag patch. Now you and your MINI can roll on without worry!